In my travels around the New York area, I ended up eating at two restaurants serving Jewish/Kosher style foods. One was Regal Kosher Deli on Long Island and the other was Russ & Daughters in Manhattan. Regal Kosher Deli is located in Plainview, NY on Long Island. They are a kosher deli serving pretty standard jewish foods. I ended up eating here on two occasions. Pickles are delivered to every table upon being seated. They serve half sour and full sour pickles. Being that the half sour pickles were devoured before I could take a picture, it's obvious what everyone's favorite type of pickle is. Bowls of coleslaw were also served with the pickles. I tried two different types of knish on my visits here. My first knish was a plain potato filled knish. This one was square with mashed potatoes filling the flaky crust. Pretty tasty. The spinach knish was my favorite of the two. It was round (I'm assuming the different shapes are so they can tell different fillings apart easier? ), filled with a potato/spinach mix. It had more going on in terms of flavor compared to the plain knish. On one visit I tried a corned beef sandwich. This consisted of a whole lot of sliced meat between sliced rye bread. I have to admit that these jewish deli style sandwiches are a little boring for my liking. I know cheese can't be added because of the whole kosher thing, but they are too much of the same thing. On another visit I tried what they called a stuffed sandwich. I ordered the Corned Beef, Tongue, and Hard Boiled Egg. 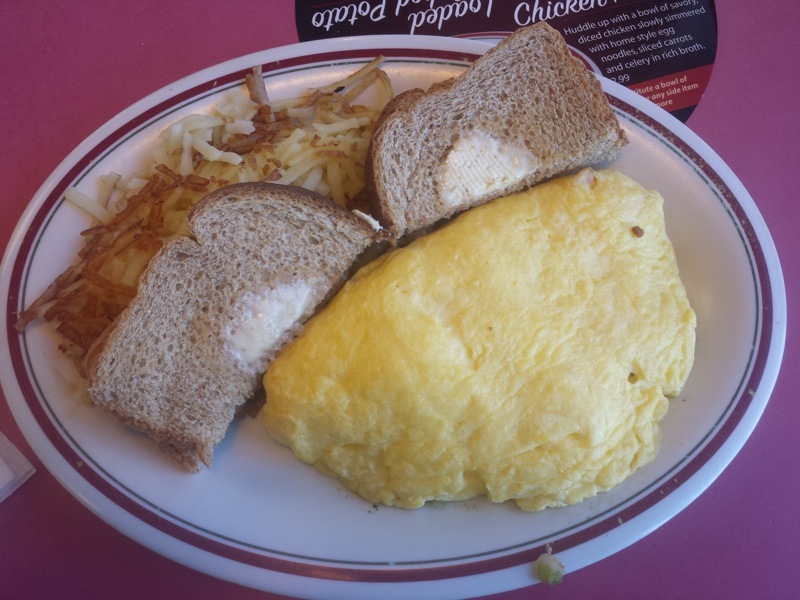 When the sandwich was delivered, the waiter informed me that they were out of hard boiled egg. I'm also pretty sure the menu said there should have been coleslaw on here as well, but that was missing too. Without those components, this was basically a corned beef sandwich stacked on top of a tongue sandwich. I did enjoy the novelty of eating sliced tongue. That is not a cut of meat that I eat very often. 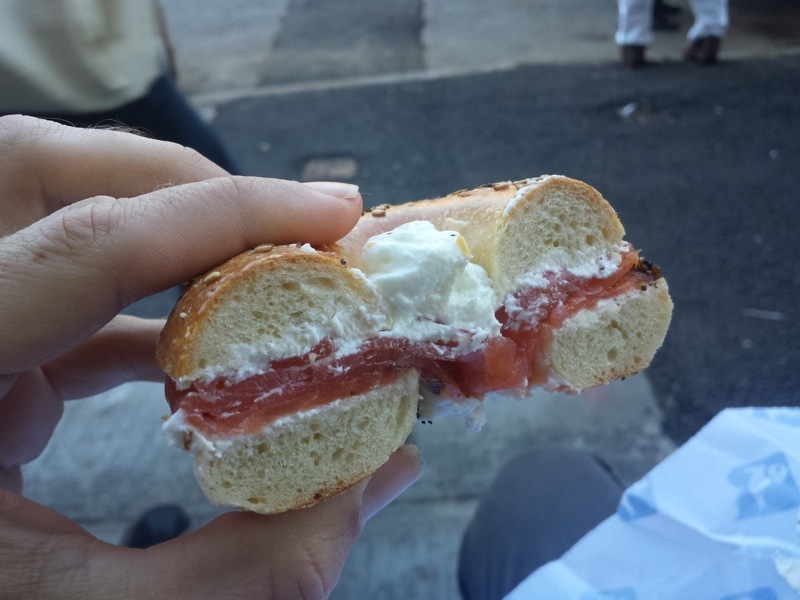 I first heard about Russ & Daughters several years ago and they have been on my list of New York foods to try ever since. It took me several more visits to the city before I finally made it to Russ & Daughters. They've been around for 101 years, so the amount of time it took me to try the restaurant was probably nothing for them. I also tried a pickle. A customer in front of me was ordering gallons of these pickles, announcing that she takes the train from Vermont to replenish her pickles every time her supply gets low. With an endorsement like that, I decided I must try one. It was a very tasty pickle, although I don't know if I'd travel from out of state for a pickle. Everyone knows Nathan's in Coney Island for their hot dogs. I've been there. I've tried their hot dogs. Hot dogs are boring. There's Nathan's franchises all over the country where you can pretty much get the same hot dogs. When I found myself at the Nathan's in Coney Island yet again, I decided to try something that couldn't be found in other locations, that being the seafood. 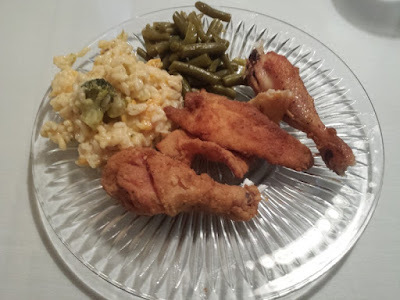 I started out with an order of the frog legs. The cashier said that they had never tried them and looked a bit disgusted about the thought of eating frog. Regardless, I split an order of them. The large frog legs were deep fried in an almost funnel cake-like batter. It was a bit different from the times I've tried the frog legs on Chinese buffets. The batter was the best and tastiest part. The meat tasted fine, but the veins and tendons in the meat got a bit chewy after the first leg. As of right now, amphibian isn't going to become a regular part of my diet. 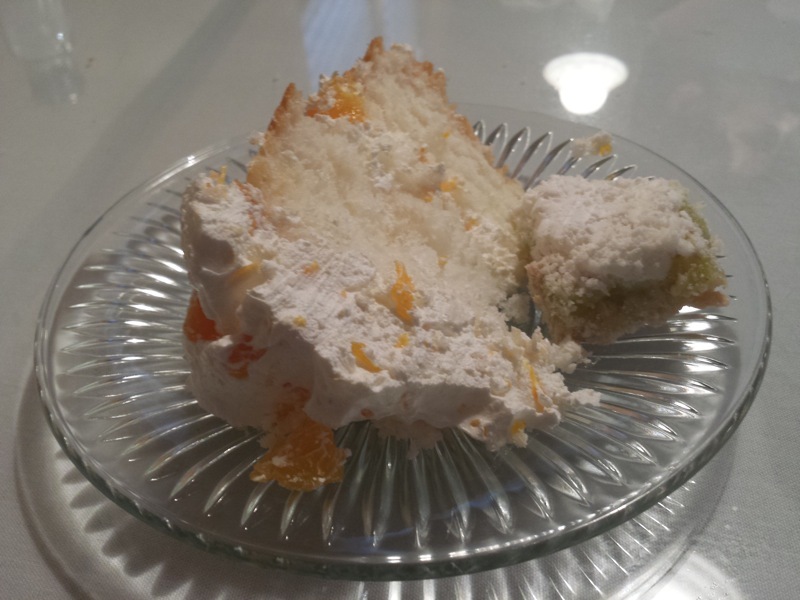 This was served with fries, cornbread, and coleslaw. Nathan's coleslaw was interesting. Instead of using normal cabbage, they made it from their sauerkraut. I really liked sauerkraut coleslaw. 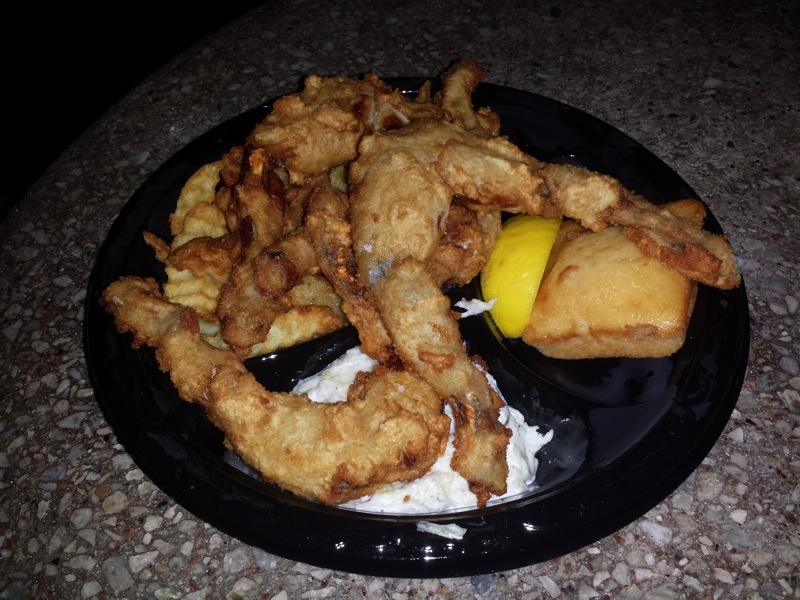 Frog legs being served at this Nathan's is interesting. I can't imagine they are a huge seller, but yet they are on the menu. I'm guessing they are a hold out from another time. Perhaps frog legs were a more accepted food for Americans in the past? Or were they a novelty food item then, and they have stuck around, still being a novelty food item for this Nathan's. I also tried the Lobster Salad Sandwich. I had a choice between the plain lobster roll and the lobster salad. 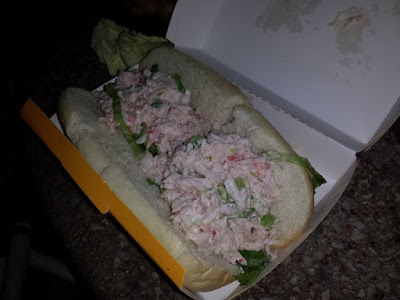 The lobster roll was served on a hamburger bun with no mayonnaise. The lobster salad sandwich came on a hot dog bun with mayonnaise and lettuce. I like foods with mayonnaise, so I went with the salad. It was pretty good. There was enough lobster in the salad where you could still see the pieces and taste the shellfish, but had a nice creamy flavor from the rest of the salad. Would have been better if it was served on a nicer bread than a hot dog bun. I had a Chicken Gyro. Several pieces of chicken filled a pita alongside lettuce, onions, and the standard halal cart white and hot sauce. This particular sandwich left some room for improvement. The chicken had lots of chewy pieces of tendon/fat. Even with the sauce, it was also somehow lacked flavor. I visited another halal cart a few blocks away from Times Square. 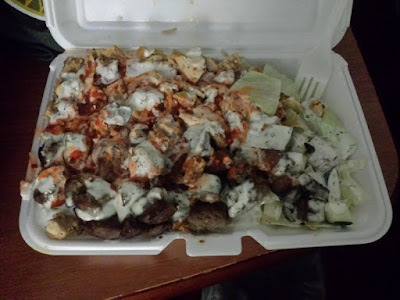 I had the combination of lamb and chicken over rice, topped with white and hot sauce. Lettuce was served on the side as a salad. I took part of a long distance unicycle ride from Manhatten to Coney Island. Somewhere in Brooklyn, the horde of unicyclists waved down a Mister Softee truck. While on a trip to New York, I ate Indian food for dinner at Ghandi Cafe Inc in Greenwich Village. This very narrow restaurant had a dinner for two special going on that included an appetizer, entree, dessert, and tea. Sauces and crackers were served first. I'm not exactly sure what to call this thin, crunchy crackers. Papadum according to Wikipedia perhaps? Somosas and fried onion balls were served next as the appetizers. I had the Chicken Vindaloo as my entree. I was a little scared of the spice level of the vindaloo based on my past experience with the dish in the city. Luckily, this version of Chicken Vindaloo was spicy, but not intolerable. Rice was served on the side to absorb all that delicious vindaloo sauce. Rice pudding and tea were served for the dessert. I enjoyed my meal at Ghandi Cafe! 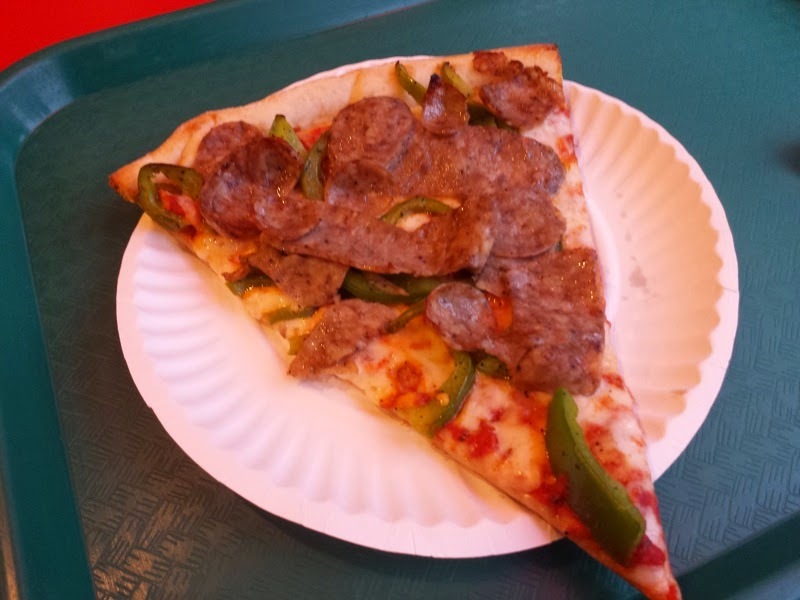 I had a slice of sausage and pepper pizza from Famous Amadeus Pizza in Hell's Kitchen. 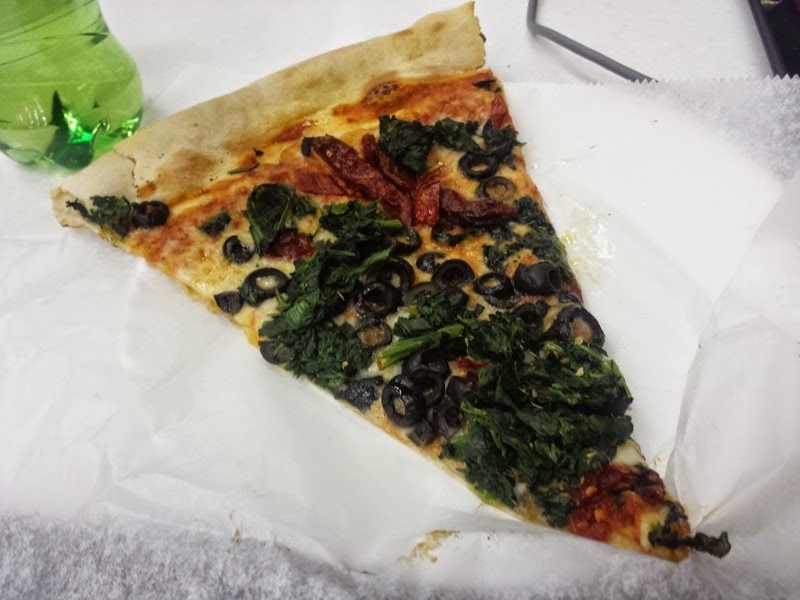 For a NYC pizza chain, I did enjoy this slice. I liked how they used slices of entire sausage instead of crumbling the meat over the pie. The bell peppers were thickly sliced. Not the best pizza ever, but far from the worst. It was a little expensive as far as slices go. I should have ordered pizza. Mama Theresa's had some delicious looking interesting pies behind the counter at the entrance of the restaurant. 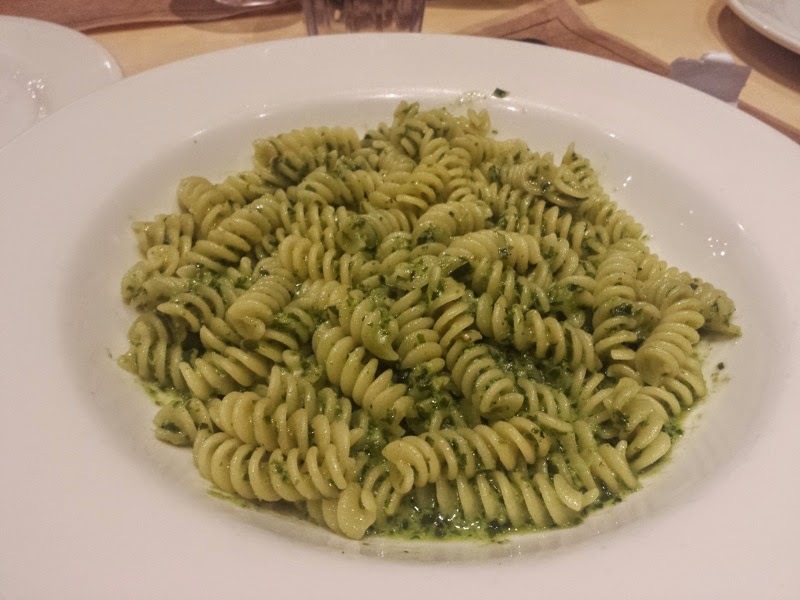 Instead, I decided to get pasta and ordered the Fusilli Al Pesto. At nearly $15, this dish was really disappointing. It was pasta and sauce, and nothing else. I don't know why I was expecting more, but I was hoping for at least something that I couldn't make at home for a fraction of what they charged here. Worst part was that the pesto sauce didn't even have much flavor. I honestly don't get the huge appeal that Grimaldi's has. 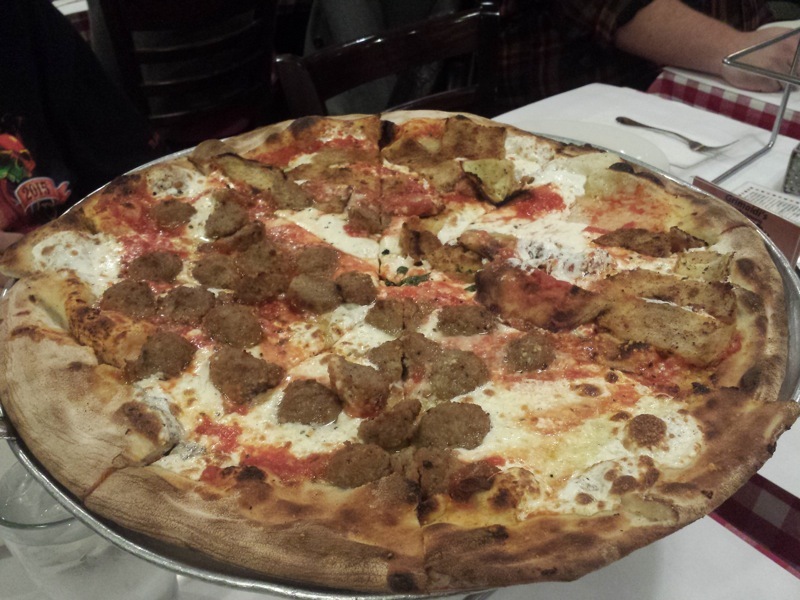 We ordered a half eggplant, half meatball pizza. Everything on here was bland and flavorless. The sauce had very little flavor. The cheese didn't seem to have any saltiness. The meatballs tasted like ground beef and nothing else. The batter on the fried eggplant was the most flavorful component of the entire pizza, but was still lacking. This Grimaldi's had a half hour wait. The one in Brooklyn gets lines around the block. I know the coal fire pizza thing is a bit of a novelty, but it's not worth waiting for when the rest of the is pizza lacking. I had a flight out of the Delta Terminal of JFK that was very delayed. I ate to kill time. I ordered a slice of vegetable pizza in the terminal. It was topped with spinach, black olives, sun dried tomatoes, cheese, and sauce. Pretty good for airport pizza. It cost way more than a slice of pizza should, but it was expected being inside an airport. I made a stop in Charleston, SC while on a drive up the east coast. I visited Charleston previously so long ago that everything was pretty much new again. One of the foods that Charleston is known for is shrimp and grits. I found a list somewhere on the internet of the Best Shrimp & Grits in Charleston, and one of the restaurants listed was The Early Bird Diner. I liked the vibe of the diner. It had some of the standard diner features, but the walls were covered with all sorts of cool sci-fi art for sale. The restaurant was featured on Diners, Drive-ins, and Dives. Guy Fieri ate chicken and waffles here. I also had a much needed meal at Southend Brewery & Smokehouse while in Charleston. This large restaurant was in a lovely old building, complete with a fun, rickety elevator to take you upstairs if you needed the restroom. As the name implies, they were brewing beer in the center of the restaurant. I had the pulled pork for my meal. The shredded pork was served on a plate piled high with all sorts of sides. There were French fries, pinto beans, coleslaw, and mustard barbecue sauce. I'm a big fan of the mustard style of barbecue sauce. I also enjoyed that they didn't serve the barbecue restaurant standard of baked beans. I'd take pinto beans like served here over baked beans any day! Over the past several months, I've done some traveling. Much of that travel consisted of driving along I-95 up the east coast. I figured I'd write a post about some of the restaurant highlights. I ended up here when I decided I wanted to sample Brunswick Stew in Brunswick, GA. After getting off the interstate and driving through Brunswick along with consulting the internet, I came to the conclusion that you can't actually get Brunswick Stew in Brunswick. Willie Jewell's in Kingsland, GA was a barbecue restaurant serving Brunswick Stew that I didn't find too long afterwards. This restaurant was located a little ways off I-95. Willie Jewell's is a small chain with a few locations what looks like Georgia, Florida, and South Carolina according to their website. I ordered the Bo-Hawg sandwich. This was BBQ pork, topped with cheddar cheese and a smoked sausage link. It was served on a hamburger bun. Cheese is unusual on a pulled pork sandwich and I've never had sausage on a barbecue sandwich like this. Willie Jewell's did served mustard based barbecue sauce, which I am a big fan of. Since Brunswick stew was the food item that caused me to seek out a barbecue restaurant, that's what I had for my side. 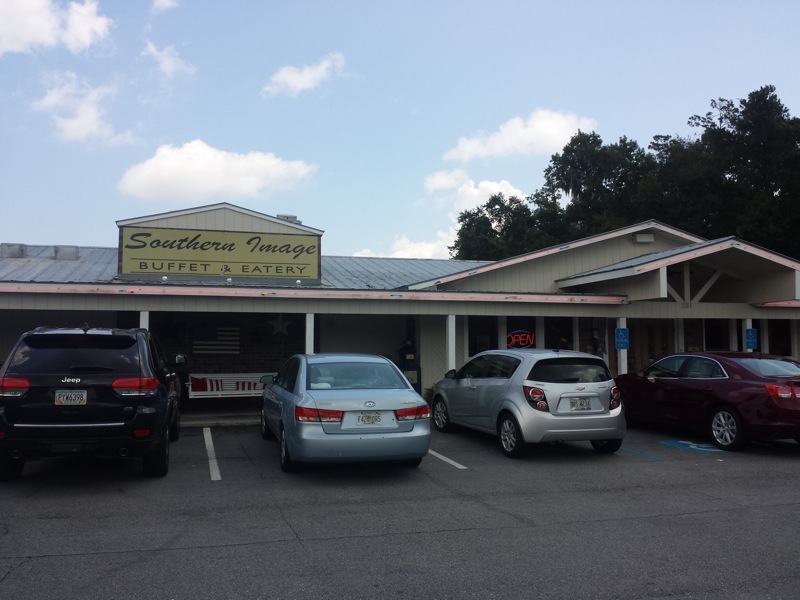 Southern Image was a buffet just of I-95. 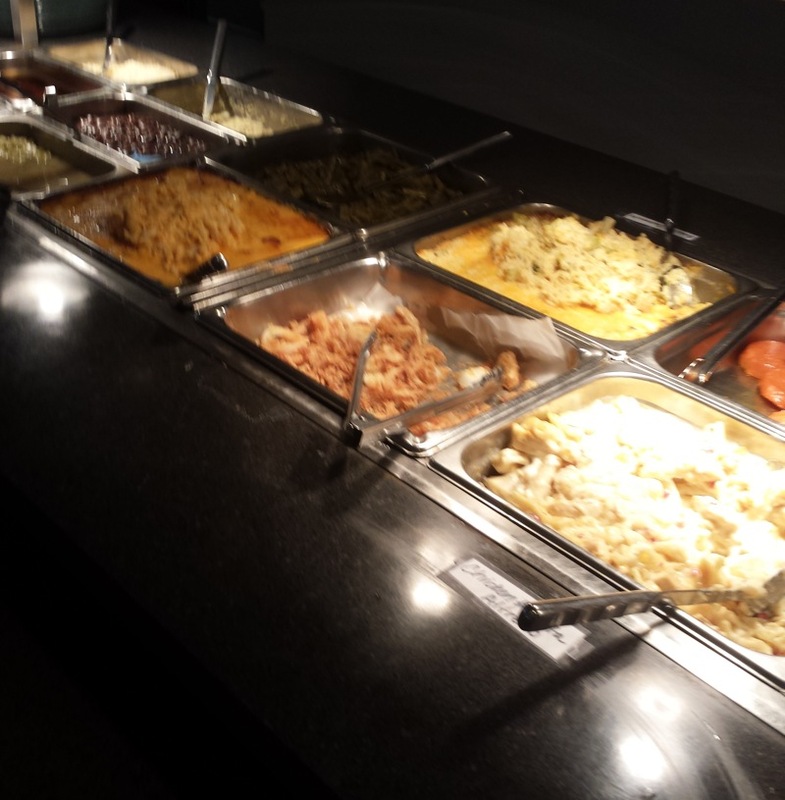 As implied by the name, they specialized in southern foods. Imagine Golden Corral, only with foods on the buffet that the typical Golden Corral diner wouldn't dare eat. Plate two consisted of lots of side items. 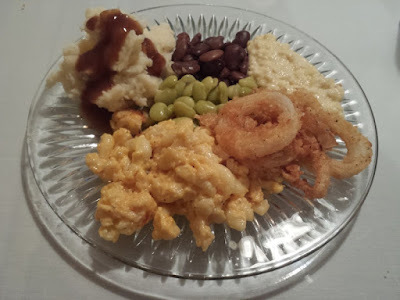 Beans, potatoes, macaroni and cheese, and onion straws were all tasty. I ended up at Smokin' Pig on a return trip to Florida along I-95. This restaurant is located almost across the street from Southern Image Buffet in a building connected to a gas station. 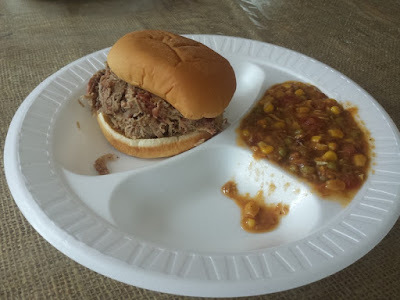 I tried a pulled pork sandwich with a side of Brunswick stew. The sandwich wasn't nearly as exciting as the one at Willie Jewell's, with only pork and sauce on a bun. Still, it fulfilled the purpose of being a pulled pork sandwich!